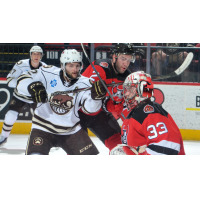 BINGHAMTON - The Binghamton Devils collected a point on Wednesday in a 1-0 overtime loss to the visiting Hershey Bears at Floyd L. Maines Veterans Memorial Arena. The Devils now have points in five-straight games. After no scoring through regulation, the only goal of the night came in overtime as Ryan Sproul got behind Binghamton's defense and beat Cam Johnson over the glove for the winner at 3:20 of the extra time. Sproul's winner was his fifth of the year assisted by Mike Sgarbossa and Nathan Walker. The Devils are back home Saturday night as they host the Syracuse Crunch at 7:05 p.m. It's another Saturday 2-Pack Night where fans can get two tickets, two hotdogs, and two sodas! Call or text "TICKETS" to 607-722-7367.